Few things make me sadder than an autographed album discarded at a yard sale or charity shop. I imagine the moment that the ambitious artist proudly whipped out his or her Sharpie, forcing the too-polite-to-say-no recipients to hide their overwhelming senses of dread. Of course, immediately the whole thing becomes all about me. How many times have I embarrassed myself signing some little Why It Matters trinket for someone who can’t wait to dump it? But as sad as castoffs make me I do love a bad album cover, and Miss Pamela Jean sure worked up a good one here. Momma’n’em picked Pammy up a purty prom dress and got her hair did, then took her up to the Sears for her photo shoot. The graphic designer whipped up a combo of primary colors and the ugliest font he could find to polish the whole thing off, but not before adding a big Carl’s Jr. star. Classy. You’re wondering whether the album is any good. Well, I don’t know. I’m willing to save Pamela Jean from the indignity of the charity shop bin, but tossing this platter onto the turntable is asking too much. 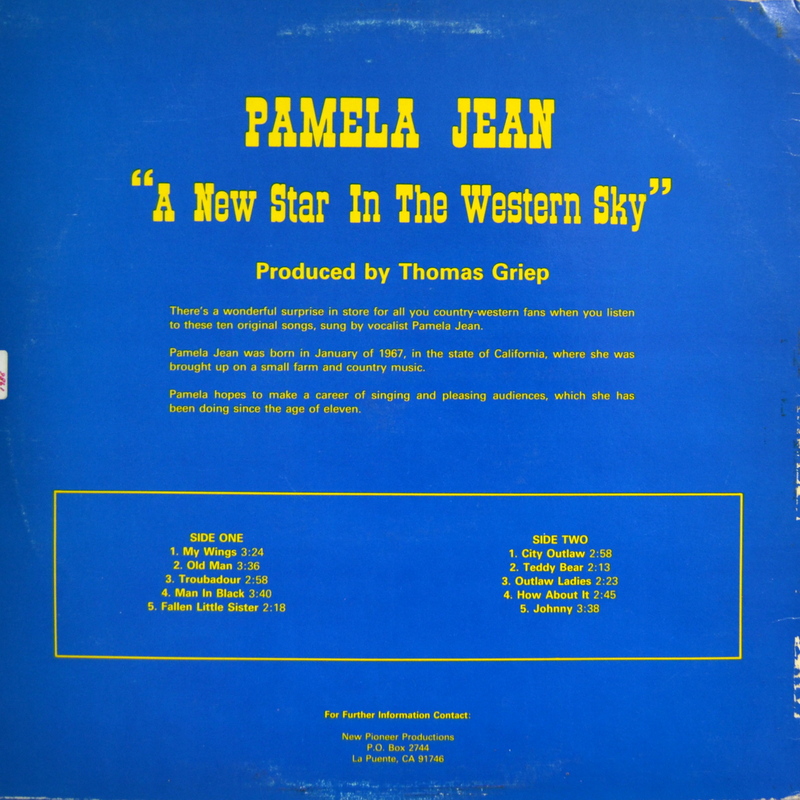 Please welcome Pamela’s Jeans’ A New Star in the Western Sky to the Bad Album Cover Hall of Fame. Great Bad Album Cover review! BACH0F worthy…but I’d have to listen to it!